LAPD carried out the commercial lighting design to this 13-storey executive tower in Moscow. Our scope included an exterior architectural lighting design to the building top, surrounding landscape and entrance. The lighting design approach for the landscaped areas around the base of the office tower was in three parts. Firstly, soft warm pockets of light to the planter areas and integrated lighting to the seating areas. Secondly, because we wanted the uplit trees to stand out, we used low glare light columns in car park areas. As a result, we achieved a soft and even light level throughout. The uplit trees formed the third part and gave a delicate backdrop to the bolder entrance area. Warm white light washes the feature yellow wall to the left of the entrance doors. Because of the vibrant vertical element, we could use a lower light level on the horizontal plane across the entrance threshold. Just before stepping into this zone pedestrians pass over a band of contrasting, cooler white light on the floor. For this effect, we used luminaires with unique optics concealed within the base of the façade fins producing a sheet of light during the winter mist and fog. 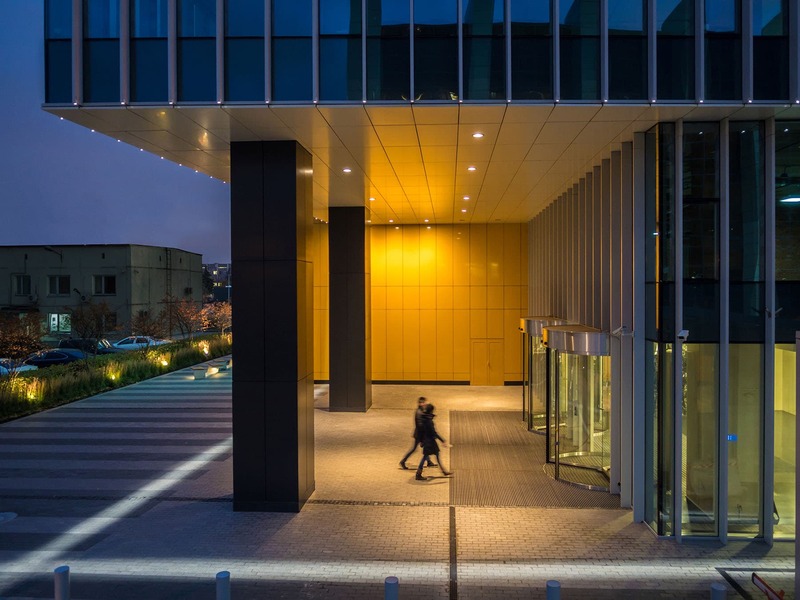 Soft illumination to the building’s top balanced the bold entrance area from afar. Linear LEDs, concealed within a cove detail, allow light to wash down some carefully selected back painted glass. By using light to provide greater definition to the top and bottom architectural elements, we framed the internally lit body of the tower. This helped to provide it with the required prominence within the Moscow cityscape.